Attention: All of our sceneries are hand-crafted! A likely mobile port later! Gradually, he gets to know the various villagers and spa guests, one more peculiar than the other. Only young anthropologist Gretchen Lemke, who is on a research trip to Trüberbrook, seems normal to him. Before he knows it, Gretchen becomes Tannhauser’s accomplice on the adventure of a lifetime! It slowly dawns on the aspiring physicist that his presence in Tüberbrook is not accidental – he is here to save the world! As the story proceeds, Tannhauser teams up with Gretchen Lemke, a student of paleoanthropology, and bumps into the enigmatic inventor Lazarus Taft. Tannhauser is an American physics student in his mid-twenties – and a clever one at that. The adorable little fellow is well-read, always curious and of a deeply friendly nature. Gretchen Lemke was always the fiercest kid in the sandbox; cute but merciless if someone dared interrupting her excavations of twig bones and toy artefacts. The somewhat overenthusiastic student of paleoanthropology arrives in Trüberbrook on an adventure to unravel the mysteries surrounding the village. Collective childhood hero Ron Gilbert inspecting our models while on promotion for "Thimbleweed Park"
The soundtrack of Trüberbrook is an original composition to fit the mood of the game – sort of a tranquil "doom jazz". Inspirations come from the works of Tom Waits, Angelo Badalamenti, Mark Lanegan, Timber Timbre or Bohren & der Club of Gore. The soundtrack has a playtime of around 40 minutes and is directed by Sebastian Nagel & Albrecht Schrader. Why not listen to the serene main theme while browsing the project? Regular Digital Version: The regular digital version of the game comes for Windows, Mac and Linux (all DRM-free or via Steam, your choice) and for PlayStation®4, Xbox One or Nintendo Switch (all via their respective stores). If the game is successfully funded, we'll contact you so you can tell us which version you'd prefer. You can also add additional copies (for a friend or for another system) to your reward by adding 25€ (or $29) to your pledge. Early Access Version: The early access version of the game comes for Windows, Mac and Linux. Enjoy the game while there are no walkthroughs and letsplays around – unless you create them yourselves, which we'd like to encourage! For organizational reasons, this version is limited and will be distributed via Steam. It will be ready around ten days before the regular release! PC Boxed Version: This boxed version is exclusive to Kickstarter and includes a physical disc to install the game DRM-free on your Windows, Mac or Linux system. Also comes with an additional Steam Key and includes some really nice haptic goodies, such as a manual and stuff. You can add additional boxes to your reward by adding 75€ (or $87) to your pledge, packaging and shipping included. PS4 Boxed Version: New! This boxed version is exclusive to Kickstarter and includes a PS4 version of the game. Comes with some really nice haptic goodies, such as a manual and stuff. You can add additional boxes to your reward by adding 75€ (or $87) to your pledge, packaging and shipping included. Art Book: The art book is one of our favourite rewards, since, you know, we have tons of artwork, sketches and behind-the-scenes material to share with you! The digital version will be available as a DRM-free download. It is included in the digital plus edition and all higher tiers or can be added to a lower tier by adding 12€ (or $14) to your pledge! The really neat printed version is a Kickstarter exclusive item and rather expensive to produce. Every copy will be numbered continuously and signed by the team. You can add more printed art books by raising your pledge by 59€ (or $69). Digital Wallpapers: The lower tiers include one random (1 out of 5) digital wallpaper in a 5k resolution. The whole set of 5 digital wallpapers is included in the digital plus edition and all higher tiers. Can also be added to lower tiers by raising your pledge by 6€ (or $7). Digital Soundtrack: The digital soundtrack is included in the digital plus edition and all higher tiers. It will be available as a DRM-free download. You can also add it to lower tiers by adding 15€ (or $18) to your pledge! Your Portrait: As in every decent guesthouse, there's a small ancestral gallery of regular visitors ("Stammgäste") at the Waldeslust. We have reserved a unique spot for the most willing backers, awaiting your portrait to join in! Our character artist Benny will draw your likeness in the style of the game – or at least he will try to! For that, he will need some photos provided by you to meet your appearence. Take a look at our own team portraits below to get the idea! As a bonus feature, there will be a short biographical note* included for these sparkling personalities, of course commented by the main character. * Please keep in mind that every submission or pseudonym needs to meet community standards: no racist, sexist or otherwise offensive pseudonyms and submissions will be accepted, also no copyright infringing material. We reserve the right to reject a submission for any reason. Thank you for your understanding! Personal Studio Tour: A personal studio tour of our facilities in Cologne, Germany. Visit our legendary main base "Studio König", probably the only professional and fully functional TV studio made up from scratch and screwed together by a bunch of art students. Here we create our weekly late night show "Neo Magazin Royale" as well as "Schulz & Böhmermann". The tour is guided by the developers of the game and includes an exhibition of the miniature sceneries used in the game. To make the most of it, we suggest a visit on a weekday, so you can get to know all of our collegues in the wild! We are somewhat flexible regarding the date and will contact you on the details once the Kickstarter is over. Attention: travel expenses and accomodation are not included. Original Set Piece: We have tons of tiny little set pieces used in the making of the actual game. Each and every piece was created individually and received a lot of work, time and love from our set designers. We'll make sure to let you choose between a variety of original set pieces once the campaign is over. Don't worry, there's certainly enough for everyone! If you'd like to add a specific reward to your selected tier, just add the corresponding amount of money (see list for prices) to your pledge. We'll then check the difference between your selected tier and the actual pledged money and get back to you after the Kickstarter to clarify which rewards you wished to include. Feel free to message us or ask in the comments if you have any questions! We'll release the game for Windows, Mac, Linux, Xbox One, PlayStation®4 & Nintendo Switch. Mobile: Right now we cannot promise mobile versions for Android and iOS, but we think the game would be much fun on tablet computers and mobile phones. We would love to do these after the initial release, as the development would certainly take some extra time due to different technical challenges and performance reasons. We've spent a lot of time working on a voice acting concept that joins in with the genetic code of the game. Since the protagonist is an American in the midst of a bunch of Germans, we wanted to reflect this in our choice of actors. In the international English version, the main character Tannhauser speaks American English, while the townspeople of Trüberbrook sport a (more or less) German accent. 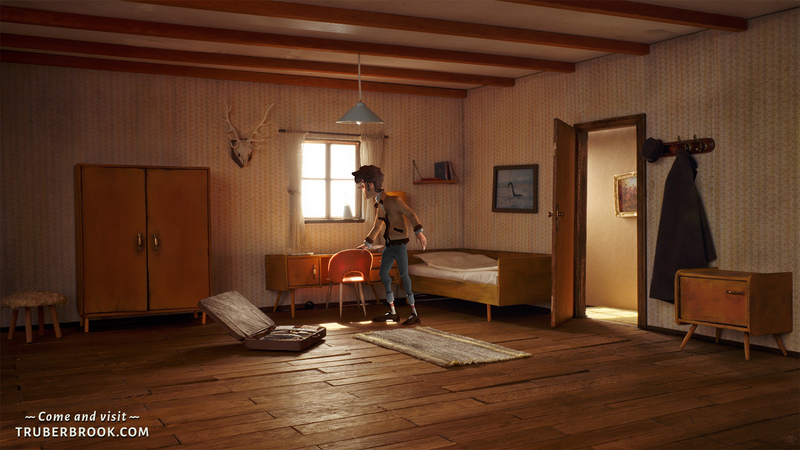 In the German version, it's vice versa: the protagonist might have a modest American accent, while the townspeople welcome him in regular German, most likely with a dialect. Both approaches bear a certain degree of entertainment, each in their own way. We are btf, an interdisciplinary team with expertise in programming, game design, writing, animation, graphic design, sound design and production. The studio emerged in 2012 from a collective of art students in Cologne, Germany. If you are familiar with German television, you might know our late night TV shows »Neo Magazin Royale« or »Schulz & Böhmermann« or our web comedy series »Gute Arbeit Originals«. As passionate gamers and die-hard adventure game fans, we crave to develop video games. Our first two adventure games were addressed to the audience of our show »Neo Magazin Royale« and in German only, whereas the world of »Trüberbrook« is set in a genuine and independent universe. Our small core team consists of Florian (director and game designer), Lea (the producer), Hans (technical artist), Lea (set designer), Simon (developer) and Benny (the character designer). The team is few and far between reinforced from the nucleus of btf by other artists, animators, designers and programmers. 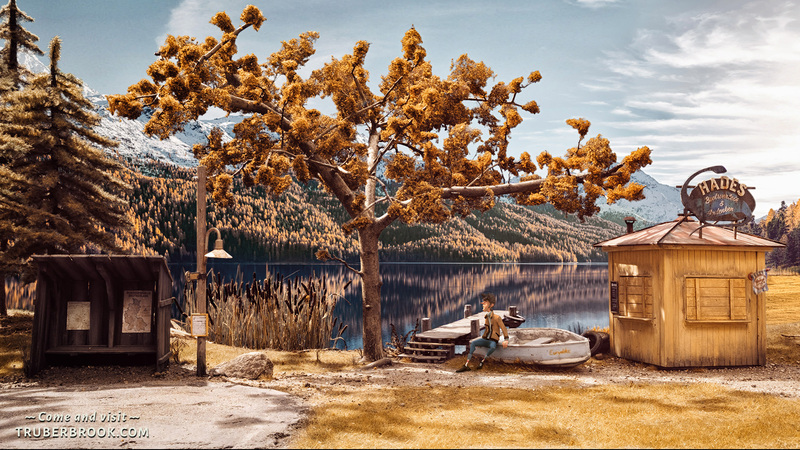 The first ideas for Trüberbrook date back as far as 2011, but pre-production was only started in 2014, when Florian approached the studio with the concept. So far, we've managed to cross-finance the development mainly through side projects. To get things started, we received a funding for the game by the Medienboard Berlin-Brandenburg, a regional media development fund. But this will only get us so far, which is why we reach out to you via Kickstarter. Though the conceptual development is already finished and most of the assets are already prototyped and tested, there is still a long way to go. The money from Kickstarter will mainly be used for the creation of 20 hand-crafted miniature scenery models, for the development in Unity3D as well as for the creation of the many assets needed, like 3D-models, animations and sounds. But ... isn't there a publisher involved? Yes, we are happy that the game will be published by our friends at Headup Games, a small but well-known indie label from Germany. As it's a pure distribution deal they don't bring any money at the table and let us keep full creative control over our game. Lore Items. When we created the world of Trüberbrook, it's characters and places, we always came up with little backstories for each and every detail. We always thought it would be wonderful and quite enriching to dive into the game if we had the chance to put all these little backstories right into the game. With this stretch goal, we'll fill the world with many little pieces that are basically not important to finish the game, but will give you a better immersion, like newspapers, posters, notes, TV shows, inscriptions, smalltalk dialogue parts and more! We hope you like this goal as much as we do, as it will make the game just more detailed. Handmade Soundscape. This is something we always wanted to do! We think our handmade environments deserve an equally handmade soundscape. This includes making foley sound effects in the studio as well as field recordings. This stretch goal is also aiming at making the game just better. New Chapter: The Prologue. This is a big one. We came up with this some time ago and are still looking forward to this: The prologue, a whole new chapter of the game that was already written along with the main story, but didn't make it into the final concept due to financial restrictions. We would still like to add this missing piece to the game somehow. If we reach this stretch goal, we'll create this all new chapter, including new handmade miniature sceneries and new characters, giving you the opportunity to explore a new facette of the storyline. We'll release the prologue exclusively as a stand-alone mini-episode for all our backers first – though it may be available for regular buyers at some later point after the release. New Chapter: The Interlude. Another new chapter with even more content and more puzzles. We can't talk about the content without spoiling it, but to give you an idea, the interlude will explore a stranger and more bizarre part of the plot, another twist, another turn, a detour, a pocket in subspace that needs to be rediscovered, a new little story to be experienced. Making-of Video. As already mentioned in the comments, we've stored tons and tons of filmed material on our harddrives. These were originally recorded to be used for the Kickstarter video, which shows but a small fraction of all the stuff we did. We would love to put together a long hands-on making-of video that mainly concentrates on the model making process, spending time with the set designers in the workshop, showing the lighting and camera work and the magical process of photogrammetry. It's going to be techy and nerdy in the raw! Developer's Audio Commentary: Be it by the set designers, the digital artists, the sound designer or the director – there's an abundance of stories to tell about every little detail in our world as we've spent a lot of time fleshing everything out. The developer's audio commentary (can be switched on and off inside the game menu) will give you the opportunity to take a surreal and wild ride on our train of thought. In the words of Lazarus Taft: "You have to see the whole picture." Or take a look at our PRESSKIT! 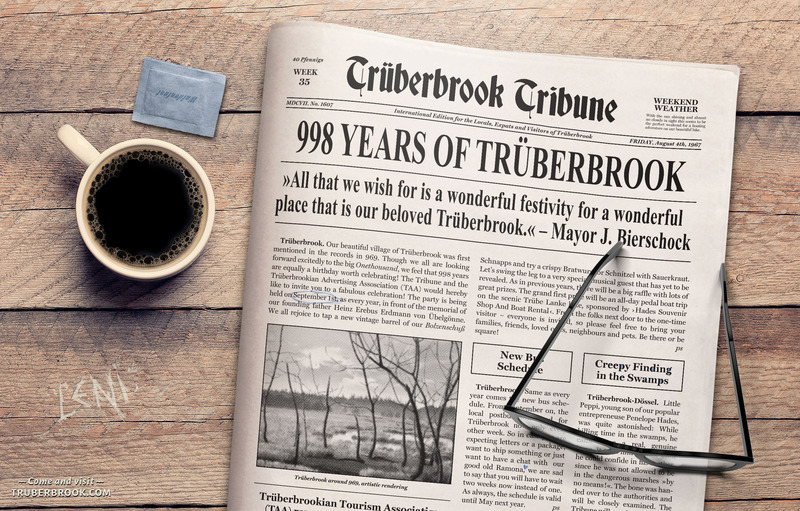 An old hat for our newsletter subscribers and facebook fans: The Trüberbrook Tribune, the local newspaper from Trübertown. 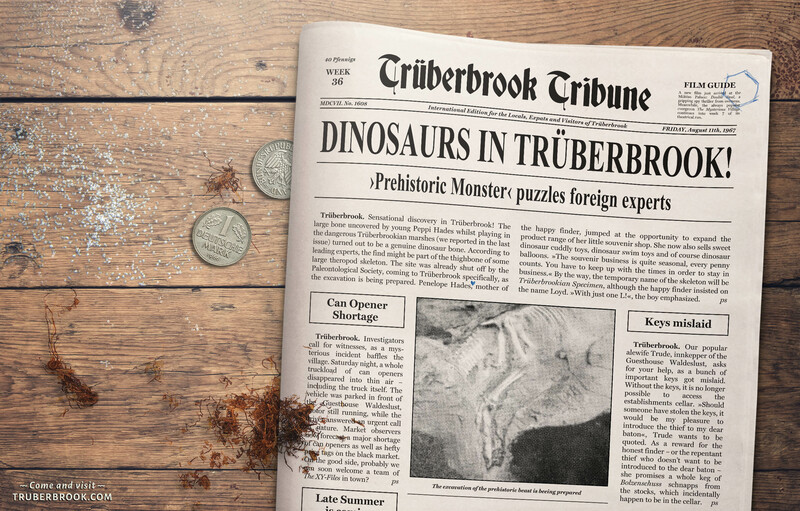 Reseached and written by ambitious Trüberbrookian journalists, the Tribune provides you with the freshest news and most interesting snippets of world lore, interwoven with the town’s rich history, even forboding events that might eventually be happening in the game. Click to enlarge and dive deep into the Trüberbrookian world lore! The Tribune is released as a single-image snapshot on a semi-regular basis and available both in English and German. Click to enlarge and find some hints to events happening in the game! If you're new to Kickstarter: You can support our game by selecting one of the rewards we prepared for you. If we reach our funding goal of 80.000 €, you enable us to develop the game from start to finish in every detail according to our vision. The amount of money you want to spend will only be collected if we reach our goal and you will receive your rewards once the game is released. If we fail to reach our goal though, your account won't be charged at all. Thanks to a funding by the Medienboard Berlin-Brandenburg and our own crossfinancing through other projects, we were able to already finish a huge part of the game. Some of the most crucial phases lie behind us, like finishing the script, the dialogues and the game design. We've also built the first half of the scenery models and checked out the best workflows for our photogrammetry process. Also, all of the character designs are finished and some of them already modeled, rigged and extensively tested within the scenes. So there's is a good vertical slice – much more than a reliable and strong proof of concept. This was important to us before we even considered to do a Kickstarter, so we could show you a meaningful status of the project. In the months ahead, we want to finish and assemble all the missing parts and pieces according to a carefully fleshed out production plan. Of course, there can (and most likely will) always be surprises and challenges in the upcoming development. Bad examples: key team members might get ill or the office burns to the ground. Good examples: key team members are having a baby or win a once-in-a-lifetime trip to the moon. No matter what, we are determined to finish the project right on time and as soon as possible! “Nintendo Switch” is a trademark of Nintendo. “PlayStation” is a registered trademark of Sony Interactive Entertainment Inc. “PS4” is a trademark of the same company. All other trademarks and registered trademarks are the property of their respective owners. Welcome to the village of Trüberbrook, your favourite harbor of relaxation and recreation! You'll receive all the updates and an exclusive 5k wallpaper. We will not soon forget your kindness and decency! Support our cause and get your very own copy of the game! Support our cause and get your digital swag! Includes your name in the credits and an exclusive wallpaper! You will also receive a complimentary key to a digital copy of the game either for Windows, Mac, Linux, Xbox One, PlayStation®4 or Nintendo Switch (your choice after the end of the campaign). Secure your early access Steam key today and be among the first to play the game! With a head start of ten days and neither walkthroughs nor letsplays out there, you are on your own! If you feel your scientific duty is to discover every secret of Trüberbrook before the rest of the world begins to realize what's going on, this is your opportunity! This reward is Kickstarter exclusive and will not be available anywhere else. Preferring digital eternity? Grab the bits'n'bytes plus edition! We prepared some handpicked digital delicacies to enhance your experience. You can't fidget with them, though. Includes a digital artbook pdf, digital soundtrack download and a set of 5 digital wallpapers (5k). Comes with a complimentary key to a digital copy of the game for Windows, Mac, Linux, Xbox One, PlayStation®4 or Nintendo Switch. There's a special limited edition for first comers: Fuel our campaign within the first 2 days and get one of the actual *numbered* boxed copies, made of real cardboard to be put on display and enjoyed with your fellow humans. Only available for Windows, Mac and Linux – also includes a Steam Key! Comes with a manual and some nice haptic goodies, but without the fancy printed artbook. Also your name will be featured in a prominent place in the actual game! By popular demand: a special limited edition, similar to our "Early Bird PC special", but for PS4! Get one of the actual *numbered* boxed copies for PS4, made of real cardboard to be put on display and enjoyed with your fellow humans. Comes with a manual and some nice haptic goodies, but without the fancy printed art book. Does not include the Steam Key of the PC boxed edition. Note: shipping fee will be applied on checkout and depends on your country. Looking for some real value? Something that stays with you? Something to put on your walls or on your coffee table? Hold on tight! Get an actual *numbered* boxed copy of the game, made of real cardboard (like in the olden days) to be put on display and enjoyed with your fellow humans. Comes with nice haptic goodies plus a neat signed printed art book. Bring your personal part of the world of Trüberbrook right home to you and obtain a unique handmade setpiece used in the actual game! Could be a tiny solar system, chair, computer, bookshelf ... basically everything that's not nailed down! That's right, we're giving the shirt off our backs! Hold on to your hat: there's a special spot reserved for you! The ancestral gallery of regular guesthouse visitors ("Stammgäste") waits for your portrait to join in – along with a biographical note. Our character artist Benny will draw your likeness in the style of the game. Take a look at our own team portraits to get the idea! Benny will need some photos of you to work his magic. Come over to our main base! Catch a glimpse behind the scenes and take a look up close at the miniature sceneries used in the game! This tier includes a very personal tour of our studio facilities in Cologne, Germany, for 2 persons, guided by the developers, including an exhibition of the miniature sceneries and touring the facilities of our TV-Show "Neo Magazin Royale". Includes two actual boxed versions of the game, two signed and numbered artbooks and two unique hand-crafted set pieces, all to be put in your hands on location. Attention: Surprises cannot be ruled out! Travel expenses and accomodation not included. You want it all? Get a whole chunk of the actual game, sawed off directly from its intestines? Come around at our workshop in Cologne and pick up one of the actual miniature sceneries. Not to mention we throw in handfull of boxed versions and early access keys on top.